With the rise in demand for fast and accurate 3D construction information, laser scanning has become invaluable to many building information modeling (BIM) projects. Scanning a construction project provides a myriad of benefits, such as saving time, lowering the amount of office work, and preventing change orders. A 3D as-built scan of a project allows architects, engineers, and contractors to plan with an accurate representation of the existing structure. However, a dedicated laser scanner might not always be the best tool for the job. Sometimes all you need is the ability to capture individual as-built discrete points with a total station to validate existing conditions on CAD drawings. Other times you might need the versatility to replicate highly accurate BIM layout points in the field and as-built discrete points as well as capture as-built point cloud data on specific areas of a project. 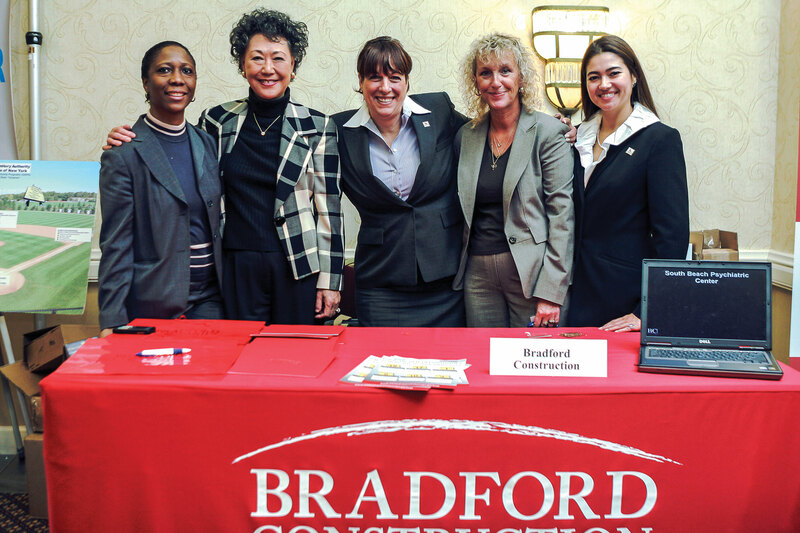 Members of the Bradford Construction team (l to r): Arsenia Palacios, Catherine Yang, Sandra Wilkin, Barbara McDermott, and Christine Rage. At Bradford Construction, we go into a space and evaluate the site conditions and client needs, and then we use the appropriate hardware and software to deliver the most valuable, precise information as quickly as possible. When we were contracted to as-built a Central Park West penthouse, we used a Leica 1200 total station to measure the space in 3D. We then used the measurements in preparation for a series of 2D plans and elevation drawings. In a single day, the Bradford team was able to as-built two floors covering 19,000 square feet. We captured walls, columns, windows, doors, stairs, and terraces across both floors. We left the field with 70%-completed base plan drawings and produced a real-time 3D CAD model that consisted of both polylines and surfaces of both floors. Our work allowed the architect to review the drawings and get a two-week lead time on designing the space. The architectural team could then design and engineer over a model that was a hyper-accurate representation of the existing conditions. Our as-builts also allowed them to avoid delay by identifying conflicts, thus preventing cost overruns and eliminating the need for rework. We also worked on the City University of New York (CUNY) Advanced Science Research Campus that will be home to two science buildings of approximately 200,000 square feet, connected by a shared ground floor that houses mechanical and electrical equipment, a vivarium (a housing for plants and animals for research), and vibration-sensitive imaging technology. Built at a cost of approximately $700 million, the campus will provide state-of-the-art laboratory facilities for the university community, housing research in nano-science, photonics, structural biology, neuroscience, and water and environmental remote sensing. Bradford Construction’s scan to BIM department was contracted by a specialty metal fabricator tasked with creating and installing an elaborate, open central stairway that connects the five research initiatives housed on separate floors. For this job, we used the Leica Nova MS50 MultiStation, a total station with an integrated laser scanner and camera. Bradford performed 3D as-built measurements of all the recently constructed, highly complicated slab edges on six floors of both of the new buildings. We measured to CAD and then aligned the designer/engineering intent backgrounds to reveal any differences between reality and the proposed design so that the stairs and railings could be manufactured one time to fit. We used the MS50 on this project because it allowed us to use three methods of measurement simultaneously. We used the total station feature of the instrument to provide the concrete company with topographic drawings of the concrete curbs that they installed. With the scanning feature, we scanned the existing steel to help design the stair railings. The point clouds allowed us to document the entire shape and structure of the existing steel and produce a 3D model. We then turned this model over to the steel company, which was able to design a stair railing to fit with the model. Additionally, using both the scanning and total station capabilities of the MS50, we were able to produce a deviation study that showed the difference between the reality and the design intent on the existing staircases and the edge of concrete slabs. We ultimately produced a series of 2D CAD plans and 3D models that were used by the general contractor and the specialty metal contractor for coordination. Our scan-to-BIM services made it possible to compare the design, engineering intent, and shop drawings with an accurate representation of the existing structures. Our plans and models validated the accuracy of the construction completed to date, revealing conflicts, which allowed the contractors to adapt. As a result, they were able to re-engineer and avoid re-manufacturing any of the key stairway components, preventing cost overruns, rework, and delay. Bradford’s unique technology paired with multi-station functionality enables us to have a full version of AutoCAD in the field at all times. The MS50 enabled us to produce the drawings directly from the field instead of stitching together the cloud points back in the office, which accelerated our turnaround time on the project. Each site must be assessed individually to determine which technology is best to complete the job in the most efficient manner. The client’s needs and the current conditions of the site should all be taken into account. Once the proper course of action is identified, the team’s expertise and talent pairs with a toolkit of modernized technology for a winning combination on construction projects.